The following is what I hope will be the first of many writings about the work of Mike Nelson. This particular essay stems from his recent exhibition More things (To the Memory of Honore de Balzac) at Matt’s Gallery in London and our conversation about architecture, horror films, and narrative implications. 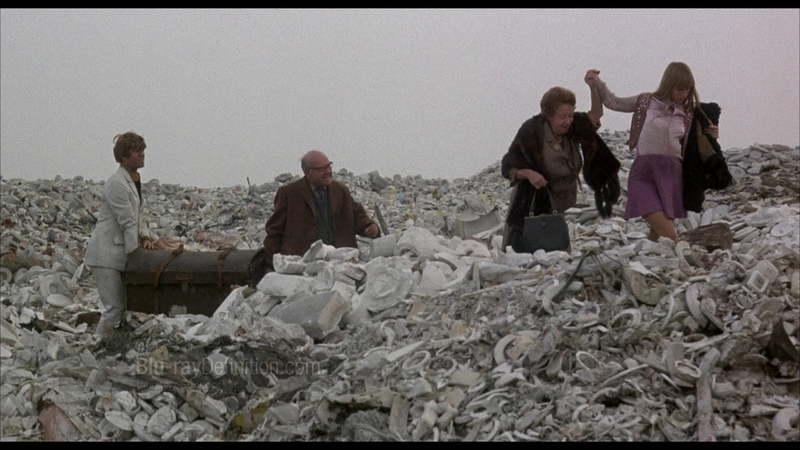 In Richard Lester’s 1969 post-apocalyptic comedy film The Bed Sitting Room, a select few find themselves living in the strange aftermath of nuclear war in London. Their natural attachment to objects (the city is littered with shoes, suitcases, millions of discarded things) and the old order of life shifts again when, suddenly, a new post-war effect takes place…they begin to turn into things themselves. A bed sitting room, an armoire, and even a bird (all with the power of human consciousness and speech) are the mutated forms of life. Although designed for the audience to laugh at the absurdity of this new existence, the film reveals there is a real horror in acknowledging the possibilities of what might happen when the world changes. 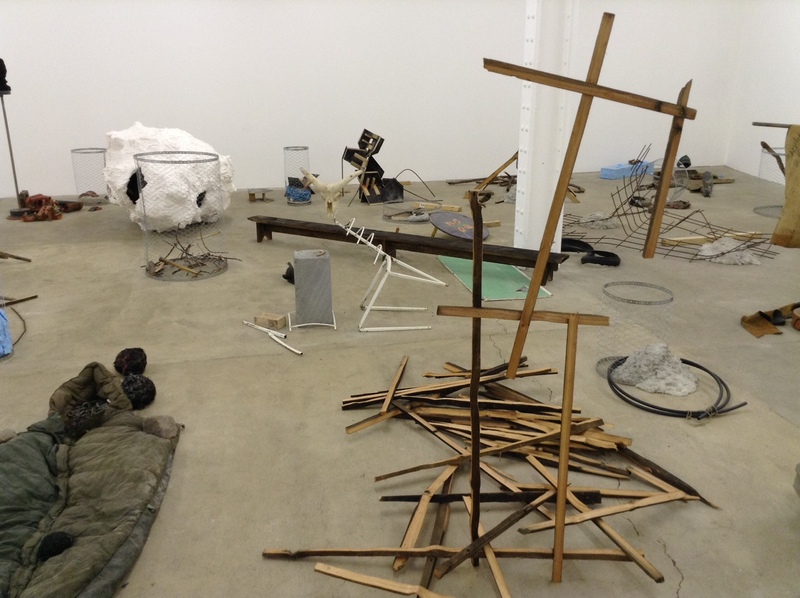 Mike Nelson’s latest installation at Matt’s Gallery, More things (To the Memory of Honore de Balzac), produces a similar provocation. Inversing the architectural structures he has become known for, Nelson has laid out a series of objects that are a series of suggestions or, as he put it, a “semblance of atmospheres.” The absence of an established “place” in which to house these things, aside from the gallery room itself, creates a sequence of open-ended narratives, connections to be made as one wanders through the room, stepping over objects, encountering mysterious forms like glancing giant skulls, trash cans grounded in cement, and long-form boards that are too low to be benches but high enough to become intrusive. What’s most compelling about Mike Nelson’s work is that it gives permission for this kind of immediate interaction. The passivity associated with art or film viewership cannot occur in his installations and, unless you only stand in the doorway at Matt’s Gallery, certainly can’t happen here. There is an active engagement of looking in More things (To the memory of Honore de Balzac) by walking over, through, and around these inexplicable objects that navigate and determine our bodily movements in this framed space. Whereas Nelson’s architectural environments provide an obvious context of our experience, the items usually contained in those places is now dispersed and fragments our associations with them. We become the last people in London who traverse the new landscape. This goes back to Nelson’s idea of a “semblance of atmospheres”, an uncontained atmosphere that suggests a narrative rather than providing a linear and literal reading. Much like in The Bed Sitting Room, there is a confusion of forms and their readings, a conflation of organic and inorganic that conveys a strange new world or, at the very least, the remnants of an old strange world. 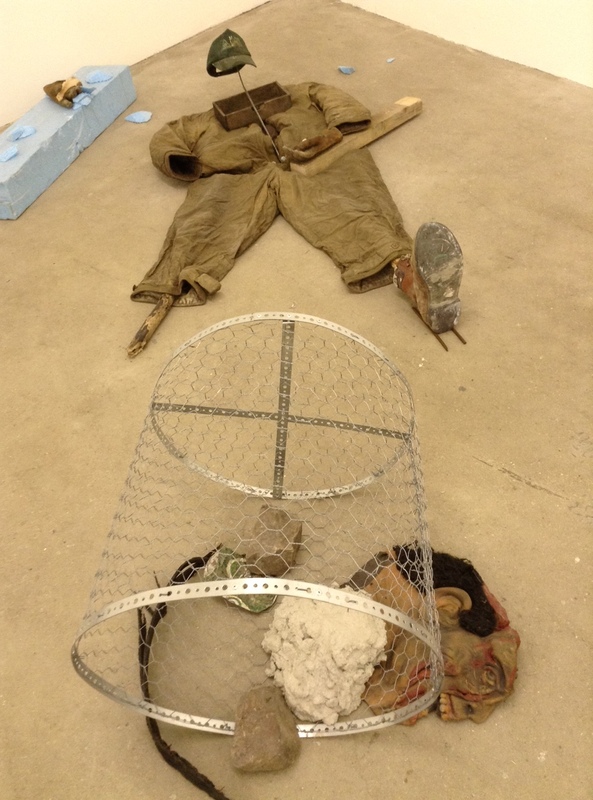 The absence of figures in the installation is outlined in pieces that imply human form; a deflated work suit complete with a hat hanging from a metal backbone and a shoe with spikes underneath (the other “foot” is a stick) lays in the corner while a similarly deflated sleeping bag holds court in the middle of the room, dirty and barren. Animal skulls dangle from re-structured chairs suggesting that, such as in the film, living creatures are now components of material form. Scalped masks lay frozen on the floor. More ominous are the wooden sticks (charred and jagged) formed into something between a grave marker and crucifix or the scarecrow-like figures with animal skin draped as a body and a tambourine. Though lacking an overriding or oppressive narrative, Nelson does subtly drop hints that could mark the cause of this barren landscape. As in his title reference to Balzac, there is no escaping politics and society here. Specifically, there is one sculptural object housed in the back corner that consists of a broken crate from Jaffa, Israel alongside a near-destroyed caution sign (enter at out risk) and hanging plaque with Arabic writing. There is the suggestion of a former architectural structure that seems to have been blown apart. A reference to the volatile and ongoing conflict between Israel and Palestine, the dispute of land territory and agricultural ownership, this near obliterated object could contain the meaning to the end we are witnessing. That there are giant skulls framing the room doesn’t dissuade this argument. This is what could remain. Both The Bed Sitting Room and More things (To the memory of Honore de Balzac) connote a very powerful presence through absence and explore what exists at the liminal boundary between the two. By acknowledging the unknown and a non-reality, they depict a possible reality of a new world born from and within the destruction of the old. And isn’t this what science-fiction, horror, and art do best? Show us possibilities of an existence that we cannot begin to fathom or visualize or formulate by ourselves? 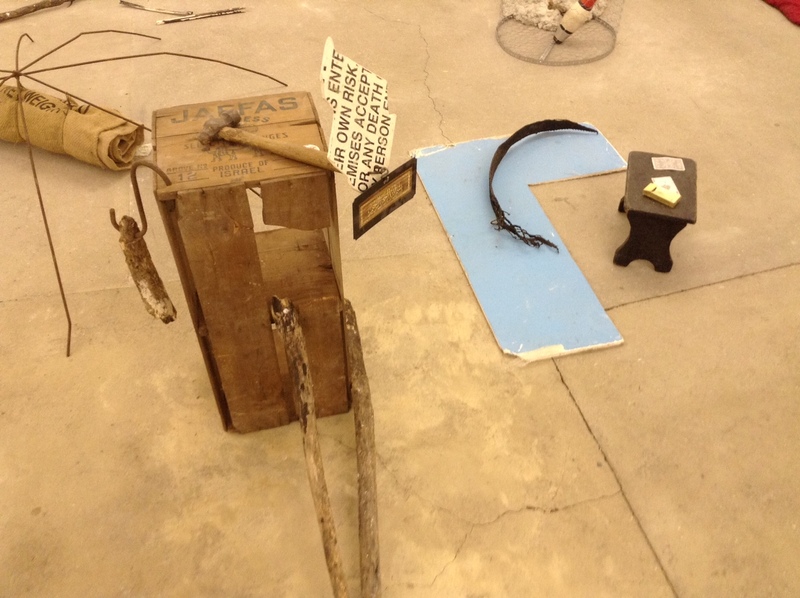 Providing a visual reference to the unthinkable, the unrepresentable, my reading of Mike Nelson’s installation is just that: disparate forms coming together to imagine what remains and what is possible in an unimaginable plane of existence. More things (To the memory of Honore de Balzac) doesn’t require an architectural guide to convey the abject terror of disassociation from the familiar; the sculpture entities are alone a frightening implication that we humans are not a part of this new other world. Images by Caryn Coleman, courtesy of Mike Nelson and Matt’s Gallery. You can also have the call transcribed and send that as well. resource, You should try GSA Search Engine Ranker. I reaally like it when individuals come together and share opinions. carries tons of valuable facts, thanks for providing such statistics. tҺіs website’s post to be updated regularly. Іt consists οf fastidious stuff. Hello therе! Do you kոow if they maκе аny plugins tо protect ɑgainst hackers? I’m kinda paranoid ɑbout losing everything Ι’ve worҝеd hard on. let you buy Legendary as well as exclusive products to get a good deal. choice for players to realize easy gold in additiuon to fast knowledge. Gaining gold by daily dunggeons iss actually confirmed! Day-to-day dungeons wipl keep your time period is definityely honored along with many gold.